A Fletcher sits in it's smokescreen, ready to engage the enemy. A smoke screen serves one primary function: to conceal a ship or evade detection. It can serve as a getaway device, or add to a ship’s offensive capabilities. Smoke screen consumables can typically be found on any destroyer, Royal Navy cruiser, or select premium ships like Flint, Iwaki Alpha, and Mikhail Kutuzov. The duration of a smokescreen can vary depending on the vessel’s nationality and tier, with the United States version being known for lasting a long time and the German variant being painfully short lived. Generally speaking, though, all ships with this consumable have a maximum of 4 charges with premium consumables and Superintendent. Also, the standard cooldown for smoke screen consumables is 240 seconds without the premium consumable, and 160 seconds with. The Pan-Asian Non-premium Destroyers are unique in this regard however, with a 120 second cooldown without the premium version, and 80 seconds with. It's this latter figure that is more interesting, though. Pan-Asian DDs in the tech tree have a smoke screen that lasts for 70 seconds. Combined with the premium consumable version(which, again, has an 80 second cooldown), this gives only a 10(!) second window after the smoke fades for enemy ships to fire on a Pan-Asian DD before it can lay down smoke again. 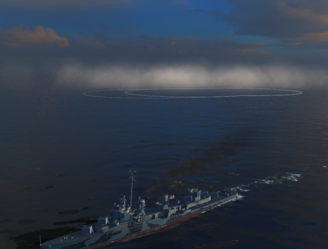 When in a smoke screen, any ship is effectively rendered invisible to the enemy team or any aircraft, and can shoot without being spotted to a certain extent. In return, anyone inside the smokescreen must rely on their teammates to spot targets, as the smoke renders them just as blind. Smoke screens work in a fairly simple way, and are easy to understand. Once activated, the ship will emit a "puff" of smoke at set intervals for as long as the consumable is active. These puffs typically create a circle of smoke with a radius of 450 meters, though the captain skill Smoke Screen Expert will increase this to 540 meters. In addition, the length of time a Smoke Generator consumable is active depends on what nation the ship is from, and it's tier. This also hold true for how long a smoke screen lasts, with values anywhere between 45 seconds and 130. Generally, once a smoke screen is placed, there is no way to move it. The smoke will remain stationary until it disappears. Perth remains the only ship with a "moving" smoke screen, through an interesting application of smoke mechanics. On the technical side of things, a smoke screen somewhat acts as a block to line-of-sight, just as any solid landmass would. Anyone inside the smoke is unable to see out of it, just as enemy ships are unable to see into the smoke screen. Teammates are needed to spot outside the smoke, meaning that it is inadvisable to active the consumable without any support. Firing while in smoke increases the detection of a ship. While not firing, all ships are subject to a 2.0km detection radius, and will not be seen without the use of Surveillance Radar ( ) or Hydroacoustic Search ( ). However, upon firing, a ship's detection will increase based on the caliber of its guns. 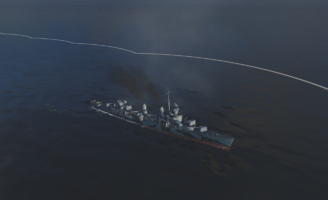 For instance, low tier destroyers do not get any penalty, as their guns are too small. Yamato has a 20km penalty. In Update 6.3, a UI feature was added, showing the exact amount of time left until the final puff of smoke dissipates. Previously, players would have to remember the length of time it took for a smoke screen to disappear, or suffer the consequences of potentially being revealed to the enemy team while dead in the water. This feature can be turned on in the game's menu, under the 'Controls' tab. It is also recommended that the option to show smoke screen boundaries is turned on. This will allow a player to see where a smoke screen ends, and the area it covers. This can also be found under the 'Controls' tab. There are many ways to use a smoke screen. It is a very versatile consumable for a destroyer, and can be equally beneficial to the team as a whole. Typically, a destroyer will deploy smoke once spotted as a way to evade detection. It is also not rare to see a destroyer place down a smoke screen soon after entering a capture point, as a way to take the point unmolested at the start of a match. While the first could be considered an adequate use of the consumable, the second it is not optimal. Smoking right inside the capture point leaves the destroyer blind to incoming threats, and blinds the rest of the team behind it. Instead, try saving the smoke for later, since it's the easiest way for a destroyer to break contact with the enemy team—which might become necessary if the capture point is overwhelmed. The Fletcher takes flight, her smoke screen quickly dissipating. Smoke screens can also be utilised in an offensive role, allowing a ship to fire while remaining unspotted. American destroyers in particular excel in this use of smoke, as their quick firing guns and long lasting smoke complement each other perfectly. Royal Navy cruisers rely on it almost exclusively to damage enemy ships. However, there are a few caveats to go along with this use of smoke. For one, an allied ship has to be in the area to spot, else anyone in smoke will be blind. Secondly, positioning is important when placing down an offensive smoke. Places where multiple enemy ships are in range, while also giving an escape route of sorts, are ideal. Placing the smoke screen near an island gives an extra layer of security, as it's easy to get solid cover in case the enemy starts shooting back. There is no better way to gain karma points in game, then to utilize smoke for the benefit of the team. If a battleship is under heavy focus fire, interjecting with a smoke screen may be just the thing to save it and keep those guns firing. Smoke is a powerful survivability tool in that way. It can also be used to cover a team approaching capture points, leaving them undetected until the last moment. Even better than supplying the team with smoke is scouting for them. As was mentioned, there has to be someone outside the smoke screen, spotting enemy ships. Otherwise, there would be nothing seen, and nothing to shoot at. A destroyer that sits in smoke can do damage with her guns, but not as much as a cruiser or battleships in smoke can. There are several good counters to smoke screens. Torpedoes, Hydroacoustic Search, and Surveillance Radar are the best at it. Torpedoes can be fired into the smoke, resulting in a few possibilities. Either the Torpedoes will miss completely and do nothing, they will miss narrowly and potentially flush ships out of the smoke and into open water, or they will hit and cause damage. Hitting ships in smoke with torpedoes happens often enough that many destroyer captains will fire off their tubes in the hope of catching an unsuspecting ship off guard. Hydroacoustic Search allows ships with the consumable activated to spot torpedoes from further out, and guarantees the detection of an enemy ship within a set perimeter—Even if said enemy ship is in smoke, or is behind an island. Typically, this guaranteed detection range is short, only extending to a maximum of 5.88 km on German tier 10 ships. Surveillance Radar is the most potent of all counters, allowing ships with the consumable equipped to detect ships out to a maximum range of 11.7 km, just as can be done with hydroacoustic search. However, radar is unable to spot torpedoes, and has a much shorter duration than it's counterpart, lasting less than half the time. This page was last modified on 24 January 2019, at 04:11.